With the ever-growing sea of digital information within and outside our organizations, comes the natural need to be able to navigate through it all and find what we are looking for – or even better, have the right information find us. The power law that most of us are used to in the context of e-commerce also applies directly to search. The curve below is typical of any search application, showing a high concentration of “hits” on the most popular keywords followed by a very long tail of low hits (down to one time queries). Understanding this behaviour is important in order to optimize and tune the search experience, as specific tools and techniques are available to deal with the different sectors of the curve. 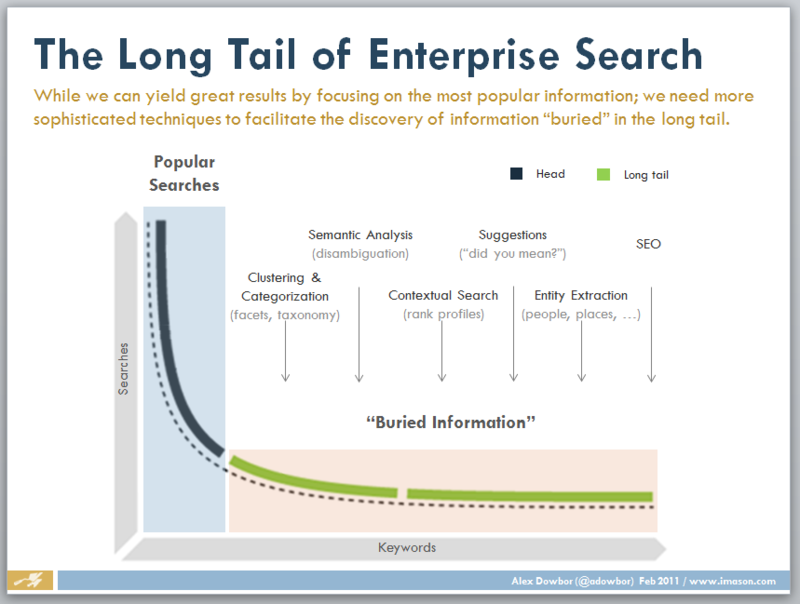 While the “head” is prone to manual intervention allowing content managers to bias known results to ensure higher relevancy, the “tail” is where more sophisticated search platforms can make a difference by surfacing the otherwise buried information in ways that provide insight to the end-users. A good enterprise search experience will, among other things establish a conversation with the user helping him or her navigate and drill down to the right information. Below are some of these techniques, from an imason enterprise search presentation.